** Choose a Tucker Belt if buying a matched holster and magazine pouch, especially if you want decorative stamping. These gun belts taper from 1-1/2 inch down to 1 inch in front and come with a chrome buckle. Lead time is 10 days or less. 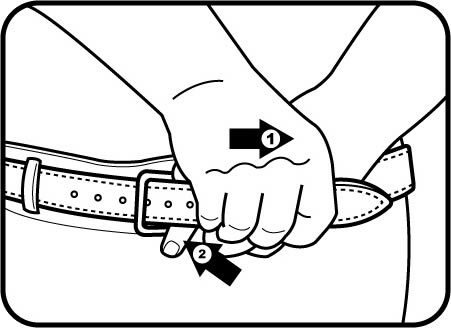 Tapering creates comfort and a dressy look while still performing all the duties of a good gun belt. This is the 2nd best belt I've ever purchased. (The best was also a Tucker with holster and double mag rig). The quality and workmanship is top notch. Very well made with quality materials....fit and finish are excellent....worth the wait! This is my 2nd Tucker gun belt. The first one is black and still looks and works fine, just needed a brown belt this time. I knew exactly where to go to get the best. I've tried other gun belts over the years and nothing compares to Tucker. Almost every belt I own now is Tucker made and I wear them as dress belts full time, with or without a holster. Quality and detail is always superb. Rob is a true gentleman and goes out of his way to make sure you're happy. THANKS TUCKER!! I have several gun belts of different widths and colors, but Rob's tapered gun belt is the best I have wore. Paired with his HF2 holster it carries my 1911 carry pistol every day and does not sag or move. I will be buying another one of these in a different color! this set of products are as I needed color great fine great. Great looking, great functioning and super great service. I carry anytime I leave my property, and have used other belts. This belt is stiff and thick as it should be to support both a large frame pistol and look good with slacks and a coat. When a small problem cropped up having nothing to do with quality, belt was replaced with out question. Bravo!! Is very comfortable with M&P 45 IWB. High quality craftsmanship. I am very happy with this belt. What a well made belt. I'm glad I ordered two!